1963 1964 Impala Sunvisors. They are used originals. Black in color. The pivots are from a hard top but you can easily swap those out. Intro-Tech Bubble Custom Car Sunshade For 1963 - 1964 Chevrolet Impala Base. Computer precision cut for a custom fit, it reduces inside temperatures up to 35 degrees Fahrenheit. It protects leather seats from becoming hot and cracking while keeping the steering wheel and shift knob comfortable to the touch. NOS 1961-64 Chevy Impala BelAir 2Dr. Sedan Left-hand Drivers Side Door Window Regulator GM 4807293. 10.7832Dr. Sedan Left-hand Drivers Side Door Window Regulator GM 4807293. 1967 Chevy BelAir 2DrSedan. Available in over 2,600 custom fit windshield applications for cars, trucks, SUV's and minivans. Computer precision cut for a custom fit, it reduces inside temperatures up to 40 degrees Fahrenheit. It protects leather seats from becoming hot and cracking while keeping the steering wheel and shift knob comfortable to the touch. Computer Precision Cut Custom Auto Sun Shade. Note: Rear view mirror cut outs need to be a little larger than the base of the mirror. This is so that your custom sun shade lasts for the long haul with repetitive installation and removal. The Reflector Sun Shade is a luxury, folding shade and it's our thickest and best shade. This luxury shade has six layers of protection and will keep your parked vehicle up to 50 degrees cooler in the summer heat. That's a big difference that you will notice. Shade folds up for easy storage and we include a nice storage bag. What I like about this shade is the fact that it looks realty nice, it has two sides one for summer and a black side that draws heat for de-icing the windshield in the winter. This shade is custom made to fit your year and model vehicle. Shade is held in place by lowering the sunvisors. The Premium Folding Auto Shade is a custom fit windshield sun shade that looks and performs similar to the Luxury shade but has a lower price. This shade is thinner than the luxury shade and has less layers but it still blocks out the sun and heat keeping your parked vehicle up to 40 degrees cooler. Shade comes with bag and is held in place by folding the sunvisors down. Lifetime Warranty and Free Shipping to USA. The Classic Auto Shade is a roll-up sunshade with multiple layers of protection. Easy to stow by rolling up and secure with attached velcro strap this sunshade will reduce the inside temperature of your parked car by up to 40 degrees. The Classic Shade by Introtech is custom made to each vehicle application so it fits your windshield way better than universal fit sunshades and blocks up to 99% of the sunshine coming thru your car windshield. This shade is held in place by folding the car sunvisors down which secures the shade between the windshield and the visors. 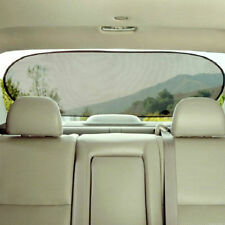 Shades have a cut-out for rear view mirrors and sensors such as factory installed rain sensors or cameras. As with all Introtech sun shades this shade has a Lifetime Warranty against defect. This shade was designed to protect the windshield from snow and ice during winter storms in order to prevent the need to de-ice the windshield with de-icer or ice scraper. However, a lot of our customers like to use it in the summer too as an exterior sunshade so this shade will work all year to protect your vehicle from snow, ice and summer heat. The biggest benefit of the exterior application is that it can block the entire windshield because there is no need for openings due to rearview mirror, rains snesors, cameras etc... Shade comes with bag and secures with interior strap and with wings on both sides that are trapped inside car. The Gold Classic Auto Shade is a roll-up sunshade with multiple layers of protection. Easy to stow by rolling up and secure with attached velcro strap this sunshade will reduce the inside temperature of your parked car by up to 40 degrees. The Classic Shade by Introtech is custom made to each vehicle application so it fits your windshield way better than universal fit sunshades and blocks up to 99% of the sunshine coming thru your car windshield. This shade is held in place by folding the car sunvisors down which secures the shade between the windshield and the visors. Shades have a cut-out for rear view mirrors and sensors such as factory installed rain sensors or cameras. As with all Introtech sun shades this shade has a Lifetime Warranty against defect. Shade is similar to the classic shade but it is thinner and has a bubble pattern. Easy to stow by rolling up and secure with attached velcro strap this sunshade will reduce the inside temperature of your parked car by up to 40 degrees. Authorized Dealer - 30 Day Returns - HUGE Selection! Block ultraviolet light.fitter the sunlight and make it no glare. Eliminate eye fatigue.Stay focused and clear vision. Universal car sun visor, good helper to drivers. Wheel gear design, tight and shockproof, sun visor organizer ranges from 115 to 195mm. DescriptionAUTO UPHOLSTERY HEADLINER FABRICIDEAL FOR REPLACING YOUR CAR AND TRUCK CAB HEADLINER- High Quality 100% Polyester Knit Headliner.- Foam Backing and has a Very Soft Finish on the Face of the Fabric- Ideal for Car and Truck Cab Headliner replacement and also Great for Lining Gun Lockers,Hunting Cabins, Box Stands and Gun Blind interiors. It is also well suited for the Front of Foam/Mesh Ball Caps, and anywhere else were a Polyester Knit Face and Foam Back Upholstery application is desired.- Width: 60"- Color: As Pictures ShowPlease Pay Attention : We have made an effort to provide fabric images that closely represent the fabric colors. However, due to all the possible variations -- light source, monitor quality, etc. -- we cannot guarantee that. Car Shade Tinted Sun Shield Visor Shield Extension Extend Driving Window Sunscreen NO Glare. It minimizes the sun's glare thereby, increasing safety in the care. It dramatically reduces glare effects of the sun, headlight or tailgates. Side shade size: 44 36cm. Back shade size: 50 100cm. 5 x Car Sun Shade. As shown in picture. Suitable for front window and rear window of all cars. Reduce the inside temperature of the car for saving gasoline with less air conditioning. It fits most car window making it the best car sun shade. 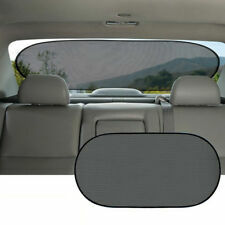 Size: Rear Window Sun Shade: 100 50cm / 39.4 19.7". Side Window Sun Shade: 44 36cm / 17.3 14.2". 1 Rear Window Sun Shade. 4 Side Window Sun Shades. We suggest 50cm length for front seat is better, avoid blocking the rearview mirrors. Considering the rail viscosity, after install the rails, p lease install curtain after 24 hours. If car window height is between 37-43cm, pls choose S size. 1 X Right 7" LCD Car Sun visor Monitor. We will reply you within 24- 48 hours. Video Input 2 channel. Car front windshield sunshade. 1 Car front windshield sunshade. 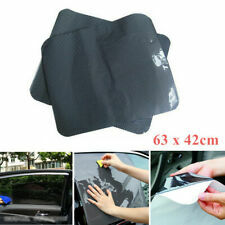 Universal Windshield Cover UV Visor Shade Sun 150 70cm Car Auto Jumbo Front Rear Windows Protection. Size: 150 70cm. Easy to install. Space saving, foldable. This product can effectively block ultraviolet rays, filter strong sunlight and let the sun no longer glare. Put the clip and tape on the sun visor, then tighten them. Mirror Size:About 346 215mm/13.6 8.46 . These pair sun shade sticker is specially for car curtain windshield. Shade sun without blocking your sight. Will go up and down with car window lift. We have warehouses in the USA, CA, and AU. Fixed point: 3-point fixed. Usage: affixed under the window, the hook is in the glass, and as the window rises, it rises and falls and falls. Car Rear Laser Fog Brake Warning Signal Lamp Anti-Collision Tail light 6 Pattern. Keep the temperature inside the car cool and comfortable. Reduce the harm to the human body. Products include: a pair of car curtains. We have warehouses in the USA, CA, and AU. Usage: affixed under the window, the hook is in the glass, and as the window rises, it rises and falls and falls. Product Color: Black. Durable 10Pcs Auto Car T10 20-SMD LED Lights Super Bright White 6000K Wedge Bulb. Material: Aluminium foil. Car accessory item in Grey Face design for Front window. We will reply you within 24- 48 hours. This product can effectively block ultraviolet rays, filter strong sunlight and let the sun no longer glare. Put the clip and tape on the sun visor, then tighten them. Adjust the sunshade to the right position for safe and happy driving. Can avoid high temperature in your car under the blazing sun. Suitable for most car type Size: Approx. 98 50cm (L W)/38.2 19.5". Enhance the privacy in your car. 2pcs x Car Vehicle Havelock. Suitable for SUV Approx. Car accessory item in Grey Face design for Front window. We will reply you within 24- 48 hours. Installs in easy way, just slide the visor organizer over your sun visor, it attaches with 2 strong elastic bands and has sturdy cardboard backing to fit flat against car visor. 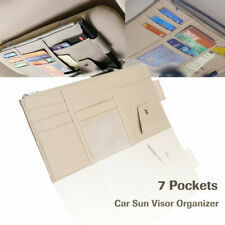 Car Sun Visor Organizer with 7 Pockets,1 sunglassed holders and 1 pen holder. Can be used for Side Window(Also Can Be Used For Windshield Window, and Rear Window But Maybe Small). Reduce heat, Protect your car's interior from sun. We will reply you within 24- 48 hours. Material: Aluminium foil. 1x Black Car Sun Visor Sunglasses Eyeglasses Glasses Holder Card Ticket Pen Clip. 2Pcs Cotton Lun Car Side Window Sunshade Sun Block Curtain UV Sunshade Visor Kit. Car accessory item in Grey Face design for Front window. Size:50cm x 47cm. Considering the rail viscosity, after install the rails, p lease install curtain after 24 hours. If car window height is between 37-43cm, pls choose S size. If car window height is between 44-53cm, pls choose L size. 1 Sun Visor. Item Color:Black(As pictures shown). Can avoid high temperature in your car under the blazing sun. Enhance the privacy in your car. Suitable for most car type Size: Approx. 98 50cm (L W)/38.2 19.5" (NOT INCLUDING SUV). 2pcs x Car Vehicle Havelock. No more frozen fingers scraping ice, frost or snow from side view mirrors Just release drawstring, remove and you are ready to go - Instant visibility. - It may be the torture of bone-chilling cold as you hack ice off of your windshield. 1 Set(4pcs) Car Curtain(2pcs back 1pc Left 1pc Right). General use,fit the 99% car models. ---Online Reply---. ---Our Promise---. Last but not Least. Fast Finish. Open the door. fashion design pictures,more personal options. Quick installation :Slide the visor organizer over your sun visor, attaches with strong bands. Type:Sunshade Storage Bag. 1 x Car Storage Bag. 4"-11" Universal Car Back Seat Headrest Phone Tablet Mounting Holder Red & Black. 1 Set(4pcs) Car Curtain(2pcs back 1pc Left 1pc Right). General use,fit the 99% car models. After Service. 19:00pm-08:30am (GMT- 06:00 USA/Canada). 9:00am-22:30pm (GMT 08:00 Beijing). Dear friend. We suggest 50cm length for front seat is better, avoid blocking the rearview mirrors. If car window height is between 37-43cm, pls choose S size. If car window height is between 44-53cm, pls choose L size.